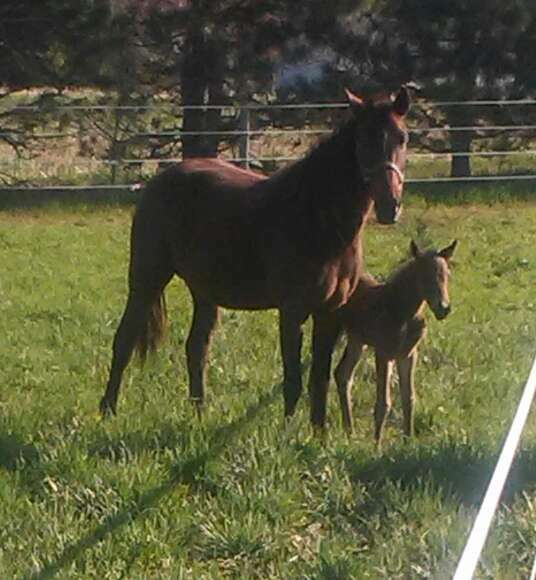 Ginger and her new foal. 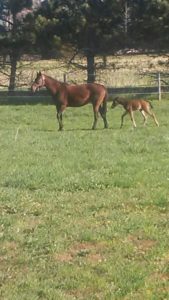 Overnight, a new foal born without help; name ideas? It’s Thursday morning around 6:30 a.m. Son Kevin, 12, is waiting on the bus to pick him up for school. We had a few thunderstorms during the night. Loud enough to keep us awake a lot so I feel tired yet. I’m letting the ones that don’t have to go to work sleep in a little longer. Last night Mose and daughter Susan and baby Jennifer were here for supper. We had a severe thunderstorm right before they wanted to leave for home. I am wondering if there could have been a tornado with it but maybe it was just the strong winds that did so much damage in this area. It flattened our neighbor’s barn and tore some of their house roof off. It downed trees and power lines. It tore the soffit from our porch ceiling off, took big branches off our trees, threw around a lot of things outside. We felt fortunate to not have anything major happen here. The hail that was hitting our windows sounded pretty big. It was one thunderstorm after another going through so Mose and Susan decided not to try taking the buggy home. Lots of roads were blocked off from fallen trees. It was cute to see little Jennifer sleeping so soundly this morning when my husband Joe, and Mose were leaving for work. She had her hands stretched over her head. Jennifer has to wear mittens on her hands as she scratches her face with her fingernails. We have tried to clip her nails down but she still ends up with a scratch on her face. She doesn’t seem to mind the mittens. Daughter Elizabeth and Abigail are coming today. She has a friend bringing them. I am glad she isn’t bringing the horse and buggy. We are having another thunderstorm right now. Kevin is on the bus and on his way to school. I decided to get this written before I wake up the rest. It seems to go faster that way—less noise around. I went to the doctor on Monday after feeling sick all weekend. He said I have bronchitis and gave me several antibiotics to take. I feel so much better! I now wish I would have went in sooner. I didn’t cook any meals on Sunday. My husband Joe made dinner on the grill for everyone. He grilled chicken and potatoes. I sat on my recliner most of the day wrapped in blankets. Monday morning our horse Ginger had a little foal. 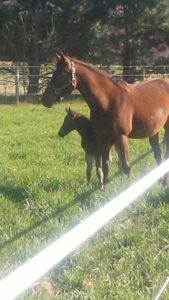 When I looked out in the pasture field after daylight, I saw the little foal running beside its mother. The little ones always look so cute how they run and hop around the field. We haven’t decided on what to name this filly yet but she is a lot lighter in color than her sister Midnight is. Horses always take good photos, don’t they? 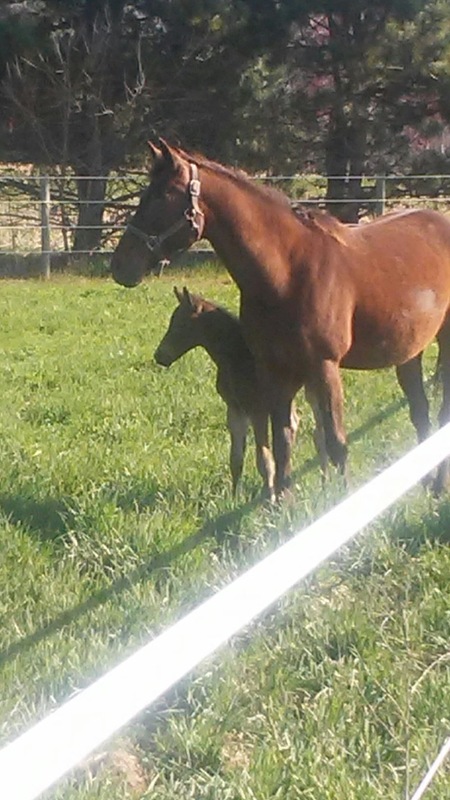 Ginger gave birth to our horse Midnight three years ago on June 1. Midnight is what Joe and I drive leading our buggy. The other foal that year was Beauty and she was three years old on May 1. We gave Beauty to son Benjamin for his birthday. Ginger’s filly she had now will probably end up Joseph’s birthday gift in a few years when she is ready to drive. Daughter Loretta was also excited when her special friend Dustin gave her a Tennessee Walker horse that is trained for riding. The horse’s name is Diamond. One horse we had for many years was named Diamond. We miss not having Diamond anymore. Loretta’s Diamond is a mare though. The horse is a smooth-gaited horse. Loretta has never ridden a horse before but is looking forward to learning. Dustin is a great friend to her and has done so much for her. I hope to see some of you readers at my book signing in Warsaw, Indiana, on Saturday. Plans are to bring all my daughters and granddaughters with me. This is the way we like to fix morel mushrooms that can be found in the wild around here. Cut mushrooms in half lengthwise. Soak morel mushrooms in salt water for an hour or more to kill insects. Use 3 tablespoons of salt per gallon of water. In a small bowl, beat egg; add milk. In a separate small bowl place flour for breading. Start with 1/2 cup and add as needed. Melt butter in frying skillet. Start with 1 tablespoon and add as needed. Put mushrooms into egg and milk mixture, then dip into flour. Shake off excess flour and fry in butter. Sprinkle each side with salt when frying. Fry until golden brown.